People always say that their dogs are part of the family. So, it’s indeed unfortunate that we generally have much shorter life spans than our human family members. A family may run through several dogs, so it becomes the challenge of each one, in the relatively limited time available, to make his/her mark, to become indelibly etched in the collective heart of the family. This requires little, if any, effort on my part. My magnetic personality, undeniable charisma, heroic nature and movie star looks sealed my place in the family hall of fame right out of the blocks. Nevertheless, it chaps my paws to occasionally hear Mom and Dad reminisce about the wonderful attributes of the dear departed dogs who preceded me. One in particular. Her name was Sydney. She was also an Aussie. I’ve seen photos and must admit she was quite cute. In fact, she and I would have undoubtedly had a hot and steamy romance if she had not suffered the misfortune of passing before she met me. What annoys me is why they remember her as being so incredible. For instance, they say, “She was so cool..she really had a mind of her own.” Of course, they must think I have the mind of a capuchin monkey (which explains why I steal bananas off the kitchen counter, leaving peels on the floor for Dad to slip on). What an inane thing to say. What they mean is Sydney refused to do things most other dogs routinely did, like chase and return a ball. A mind of her own? I call it insubordination, calling for strong measures of progressive discipline. But I suppose I shouldn’t begrudge my predecessors their posthumous adulation. I will be content to assume my place, however short-lived, in this little slice of insanity I call my family. Someday, some other dog will probably be hearing, “Flapjack was just about the best dog ever!” I’ll be listening and humbly agreeing. 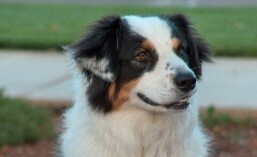 This entry was tagged aussie, australian shepherd, blog, dog, humor, life of a dog, life span. Bookmark the permalink.